Like I didn't have enough projects going with the camper right now...I find this! I have no idea where the water intrusion came from or when. I just can't believe I (and my father-in-law) would have missed a soft spot like this when I purchased it a few weeks ago. I swear I pressed on and inspected every square inch of floor and wall space in that thing. Maybe I missed it or maybe it just happened and the floor just hadn't softened up yet. I took up a section of the vinyl flooring and was able to make this hole with my hand. Fortunately, the insulation was not very wet underneath and the framing is sound. So it the wall and sill plate...again thank goodness. It doesn't extend under the cabinet more than an inch or so and just in the corner. Not enough to justify removing that cabinet (major project to get it out).I've removed the vinyl in inside the cabinet and it doesn't extend far and I have access to treat it. The central wet area is where the hole is. Here are a couple shots of the area. The water pump is in this cabinet to the right of the sink. No damage that I can see near there. There is ever so slight puckering of the wall paper below the window and on the left side of the cabinet where it meets the wall. But everything feels solid. I know water takes strange paths sometimes, but I don't think the window could be the source in this instance. There should be other signs between the window and the hole...right? Framing inside the door is perfect. No water signs there. Fabric under the camper is all in tact with no issues either. Roof caulking looks ok in this area as well. I was able to sneak my hand behind the siding by the door and the insulation is dry. Did the PO spill something? Was the door left open? Any ideas what caused this? The bad floor is removed. I took out the insulation for good measure. It's easy to replace and will help things dry really well. My plan is to order some Rot Dr. and treat the area. Patch the floor and seam in a new piece of vinyl flooring. It will be next weekend before I can get it treated with the Rot Dr Epoxy so I have some time to locate the cause (if it can be located). IMHO If the insulation was wet that's more than something spilt. I would tend to agree. The insulation wasn't "soaked" some of it was damp, but not much. Wrinkled paper under window? I would be checking around window with moisture meter then soak it with a hose and check again. if the butyl under corners was bad water why not around window? Good advice. I'll try that. I might pull the window anyway, just to rule it out. The reason the window doesn't seem plausible is: 1. the tape around the window doesn't look bad at all (of course that doesn't mean it isn't). 2. There is no wet insulation in the wall and floor gets dryer between the window and the saturated area. Sneaky indeed. The water pump has my suspicions a bit more than the window. It could have run along the wall and snuck under the flooring at the door. Nothing is ruled out. Everyone is a suspect! This one is being sneaky for sure. I'll throw out a thought, the gravity fill port to fill the fresh tank looks like it lines up to the sink cabinet. The green stripped fill hose is one royal pain in the neck to get it to seal as the ID is wavy. And then there is the vent line too which may not be sealed tight to the fill spout door unit. The fill unit has 2 male spouts on the back to connect to. If the PO fills his tank and lets the water spurt out, that can create a situation if the hose is not sealed tight where that green striped hose or the vent tube can leak water inside the camper when it back spurts out. Then water follows the floor line to the low spot and hangs out. Maybe take a look. I'm assuming you looked high and low at the door flange if water was getting in there. That would explain the right area at least. Are there any water stains in that area? The front of the camper side door frame is easier to explain than the back side of the door, but never know. That wrinkled wall paper is a clue, either water wicked up it or water ran down it, or it was wrinkled on day one at that factory as 3 maybe ideas. The discoloration points to damage that was created I'm guessing 6 months to a year ago. It is not 1 month, with this time of year and it being so cold out before the last few weeks. For sure have to find something before you button it totally up. Over time my entry door would not close right. I thought I was going to bust the glass from twisting the door trying to close it. Do not know if it was ever built on day 1 with an even gap up top or not, or the whole camper sags to the back over time or both as I have to deal with my front door soon too. I can see the front door bottom is below the door frame and I'm scraping the sill plate trying to close it. The rear entry door was off up top in the curved corner. PS. Great pics and very helpful for the future. Sorry to see this, Scott. I think this is the first non-Que '07 I've seen with water damage. Sneaky for sure. Any idea how the previous owner used it? Seasonal? Stored in a lot often and not used? John, that fill port is an interesting theory. I'll have a closer look at it. I think if I remove the grab bar from next to the door and a couple staples I can get a much better look and feel for moisture or staining in the wall. The door flange shows nothing. The door seal has a nice even dark ring where the seal contacts the frame all the way around. This tends me to think the door is sealing properly. Another possibility the door could have been left ajar for a period of time and allowed water in? We've got several more days of heavy rain forecasted here, so it will likely be the weekend before I can dig further. Right now she's under cover. I'll have another look at your door thread I have looked at it, but will need to study it again. Definitely need to get it in there proper, if it wasn't already. I didn't notice any issue with it being out of square, but never really looked too close either. PO said he kept it under cover at his home. I'm starting to doubt that spent much time under a cover though. I'm debating whether or not I should call and have a conversation with him about this. Maybe I will if I can't figure out what the source of the leak is. If he knows about it, I doubt he will be very forthcoming. Check your j-trap under the kitchen sink. We also have a '07 276 and that was the first leak I had in mine, either from the factory, and/or worked loose on the trip home from the factory. I did some more thinking on your water spot. Here is a thought. This pic tells a lot. From my rot experience and later learning about others rot experiences... I'm a "think'in" that the rot started at the head of the arrow area. And the over time, the water wicked out across the OSB board. Rotted OSB falls apart in the most water held area first then spreads. You said the door frame was clean and sealed. The wood looks good on the door frame so that helps back up story water may not have come through the door frame seal to the camper. 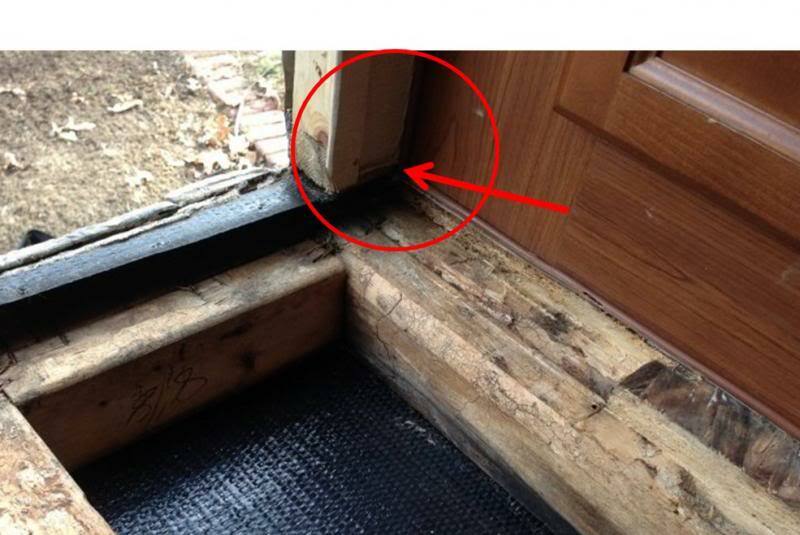 The way the door threshold is made it is UN-natural for water to come up from under the door threshold and then in. The Darco looks good but if it came up from the bottom, the insulation should be soaked by the time it made it to the bottom of the floor and it was not. The wallpaper in this pic down at the floor line "looks" like there may even be a rusted staple or 2 and the paper is puckered. 1. Did it blow in the door? Maybe but then why isn't the carpet musty? It somehow pooled in the area of the red arrow above and can be under the linoleum. Maybe it blew in, by the time is was realized and mopped up, the infiltration was done. If that is the case, it took time to get in there. Maybe 4 to 5 hours or a few days. If it did run inside the cabinet and was there a while, take a real good look at the wall paper right at the entire length of the floor line in that cabinet. Some pics can help too. If you find the paper down at the floor line puckered, they helps build the case it came in from somewhere in that cabinet. And is so, then where does it stop the pucker? Hope this helps. We all learn from these kind of things. John: Plenty of sources right behind that cabinet! Supply line from tank to pump, valve and hose for winterizarion kit (if installed), water pump, hot and cold supplies to kitchen sink, sink drain (that j-trap I mentioned before) pipe. If I remember correctly the fill line for the fresh tank, too. FYI that cabinet is a shallow pantry. On the other side is the kitchen sink with three drawers under it. You acess that area by removing the drawers. I really appreciate the suggestions. John, I believe your arrow is correct as the entry point where the water slipped under the linoleum. I can reach my fingers under the siding and around the door frame and I feel only dry insulation, so my suspicions steer away from the source coming from above. I'm not eliminating that possibility, just trying to follow clues. Mack is correct. That cabinet has a shallow pantry, then on the other side of it is a stack of drawers under the sink, then next to it is the water pump and winterization kit. I have looked for signs back there and don't see anything. I'll look again closer for pucker though. I've attached a pic inside the shallow pantry. I removed the vinyl flooring there too, which is what you see in the attached pic. Some water staining, but not soft. 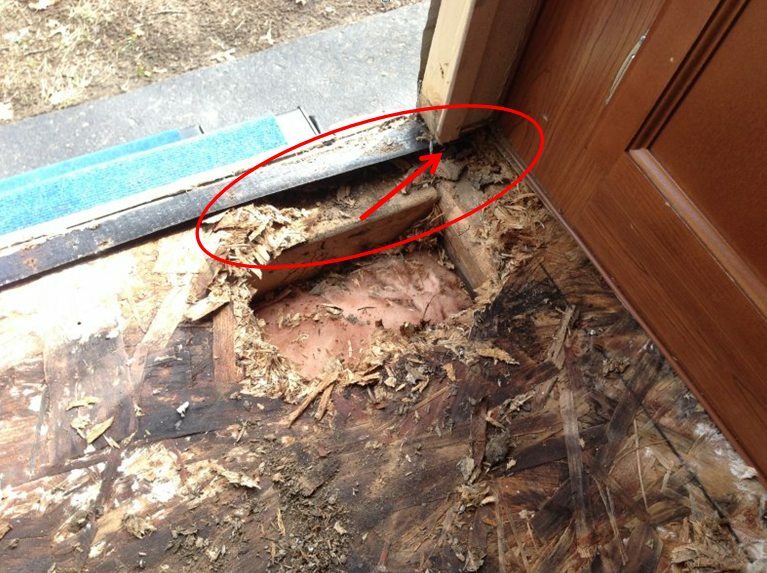 If water leak onto the surface of the floor from under the cabinet (pump or sink trap) it must not have been able to get under the flooring where the bottom plate is screwed to the floor, so it just ran along the wall until there was no bottom plate - precisely at your arrow - then snuck under the flooring into the OSB flooring and wicked outward from there. As I type this I lean more and more toward the trap or pump. Here's a thought....I'm not too familiar with how the "winterization kit" works. But I know it's there. I think there is a tube there to syphon antifreeze into the pump or something? I assume there is a valve that opens and closes it? If so, and if the winterization valve were left "open", then tank was filled and the pump turned on, would water flow back out of the tube onto the floor? There is no "open" on the valve per se. It is either pulling water from the tank or the siphon hose. If it is open to the siphon hose the pump would draw air. Now one possibility, if the valve was set to siphon and the pump check valve leaks while on city water pressure you could get wster out of the siphon hose. Yah, that makes sense. I'll give it a try it just to see, in case that check valve happens to be bad. Thanks for clarifying. The design of the door threshold makes perfect sense why the water entered at that corner. The cabinet and the threshold would just funnel it right back there.